Like what you see? Purchase a print or ebook version! “Sure,” I said. I dug through the art folder–clipped from a coffee table book of Max Ernst art that had died of a broken spine–trying to find My Friend Pierrot. Then I looked a second time. And a third. Ernst’s coral towers, his jungles teeming with teeth, his architecture with organics…it was all there. But the motley fool capering with an impossible hat beneath an impossible moon…that had vanished. They call it the third place. Neither work nor home, a third place comes without the marionette strings and strong negative associations that come along with a workplace. It’s free of the endless distraction, chores, and laundry that swirl about the home. A third place is a sanctum apart, a place of peace and productivity. For many, their third place is a library. 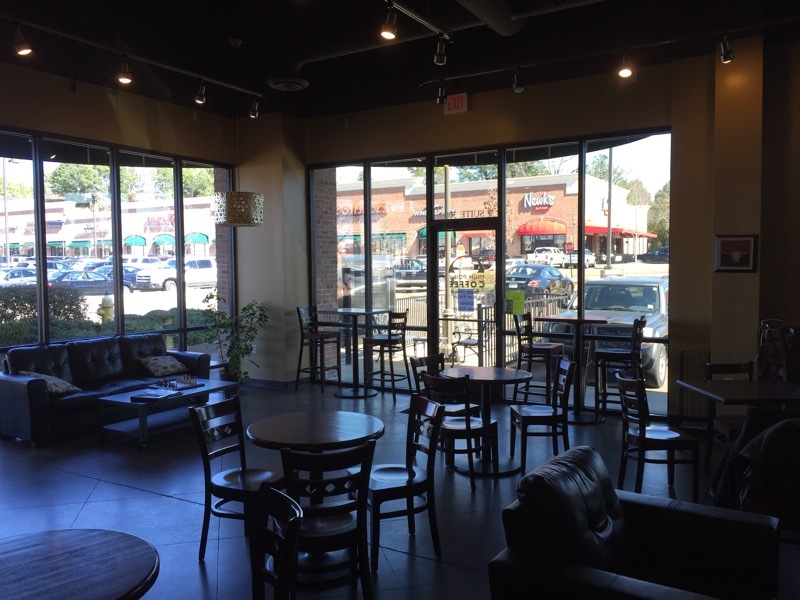 Ample seating, books leeching the musty odor of delectable knowledge, and–most importantly–free internet access. But for a librarian like me, libraries ARE work, which means that relaxation and creativity and free internet access without dirty laundry must happen elsewhere. What better place than a coffee shop? Life-giving, elixir-of-the-morning coffee (iced, of course, even in the dead of wintry mix February) plus wireless that usually works when you don’t have anything important to do plus a generous supply of tables and comfy chairs. Plus, for a hermit like me, the constant comings and goings of people jonesing for java can lend an air of sociability to a solor witing session. 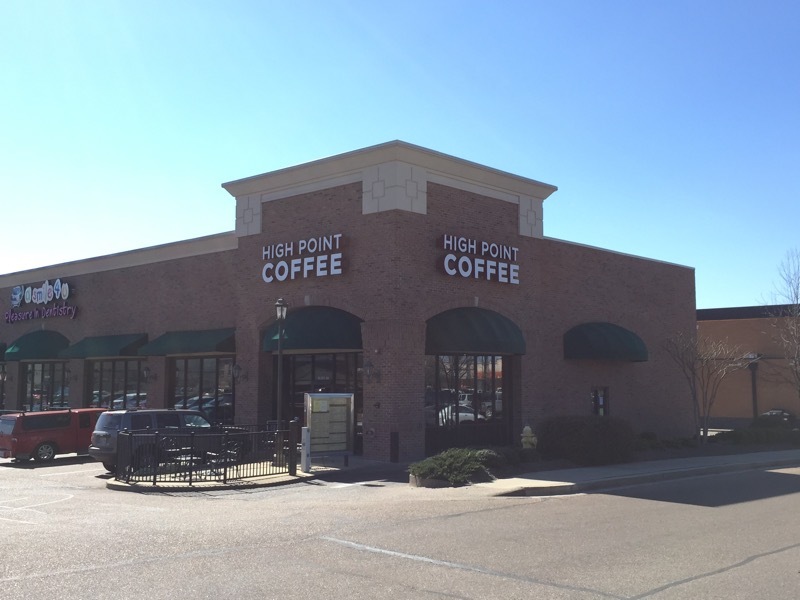 Starting in 2010 or so, my third place was High Point Coffee just off West Jackson Ave. It wasn’t ideally placed, being in a strip mall perpendicular from the main college causeway and not easily visble unless you knew it was there. For the first few years I lived in town, in fact, I had no idea it existed. But for National Novel Writing Month 2010, I was invited to a write-in there by a fellow scribe. They never showed up, but I kept coming. It wasn’t even for the coffee at first; I fell in love with the armchairs that let you sink in deep and nest, the titanic ottoman that could hold an entire disseration or novel revision, the crackling gas fireplace. With a double-bank of windows there was always plenty of sunlight, and an airy open layout allowed for maximum customization of tables, chairs, and snaking cords seeking the four precious outlets. In time, once I realized that the caramel frappuccino I’d been drinking was a little too cold and a little too sweet, I fell in love with High Point’s iced mocha and iced vanilla (without whipped cream, of course, since I’m watching my figure). The large size of each was enough to fuel an entire session of third place noveling or blogging, augmented on occasion by a delectable $1 jumbo chocolate chunk cookie (but not the raisin cookies, since those imposters are disappointment made real and set loose upon a sinful world). 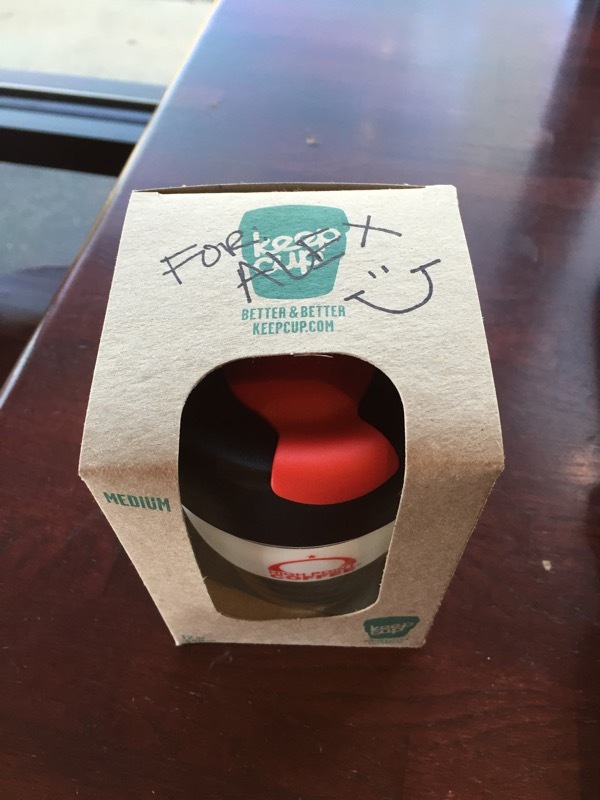 It was to the point where, when I approached, the baristas sometimes had my favorite already started. I only threw them a curveball by asking for the pumpkin spice a few times. It’s kind of funny, and maybe a little embarrassing, how much someone can get wrapped up in their third place. Half of the pop songs on my iPod were yanked from the very air of High Point by SoundHound fur purchase. The baristas often became my friends as they came and went; I think half of the stylish people in my local circle worked there at one time or another. I took out-of-town visitors there, took dates there, even glued foam heads to their wooden coffee stirrers in one memorable art session. When I became a National Novel Writing Month honcho in my own right, our most informal and celebratory meetings were always advertised on Facebook with a coffee bean motif. A Starbucks opened up just down the road on the site of a bulldozed Burger King the other year, and another indie coffee shop–much narrower and less well-lit, with uncomfortable wooden hipster furniture–not long before that. Both places fronted the main drag, meaning they were more easily visible. And though there were certainly busy times, especially near exams or after football games, the great draw of High Point as a third place was that you could always find a place to sit and spread out. I had long feared that my third place would close, and gave them plenty of business to try and forestall such a horror. Every NaNoWriMo write-in had a table tent admonishing attendees to buy all the java they could. And yet, when they announced with less than two weeks’ notice that they’d be closed forever by Valentine’s Day, it hit like a sledgehammer. I’d built so much of my routine as a writer and as an (attempted) leader of writers to that one place. All but a few of my friends were out of a job. Generous tips in the last few weeks and a souvenir keep cup were all I could manage. If that sounds a little silly, getting all busted up over a java joint closing, consider this: of my 2200 blog entries, perhaps 20% were written there in the grip of a chair deeper than a philosophy course. Every novel I tried to write from 2010-2015 was attempted there as much as it was at home; I owe three finished drafts and four unfinished ones to my third place. When I had mind-numbing chores to do at work and an open schedule, I’d sometimes retire there to work in peace and rate undergraduates or read faculty applications. Worse, no other place is as close or as bright or as comfortable; ever since the library where I work installed a Starbucks above my office they’ve lost whatever luster they might once have had (their coffee is awful too). The other indie shops in town are either too far away or too uncomfortable. There’s one other High Point location, the last survivor, but it’s downtown where the parking is meager and the drunks run thick. It’s always packed to the gills and overrun with weirdos, like that creepy dude who takes surreptitious pictures of ladies’ lower limbs. I’ll live. I’ll find another third place. But you never forget your first, whether it’s your first third place or your first indie java joint. Farewell, HPC West; we’ll always have the writing. Some people say I’m only a horror writer. Now, that’s not fair. Sure, most of my works have oozing guts and dripping eyeballs, but so what? That’s the culture I was marinated in, a world of cheap slasher movies with gory covers lining rental shelves made of repurposed gutters. I wrote what I knew, and it got me a little money, so I kept writing it. But I can do stuff other than horror. I wrote a fantasy once, you know? Published it under a pseudonym with Tobor Books. No one’s ever found out about it, but it did make the list of notable new books that year. Granted, it was under the “worst genre fiction” heading but hey, that takes a certain amount of talent too. And considering how blitzed I was when I wrote it, anything other than mediocrity is a win. And science fiction, too! I wrote for one of those anthology series for a while, you know, the ones they were crazy about in the 80s. A different story every week. Mine never aired, though, since the series was canned, but just you wait until they put it out on DVD. Then you’ll see. Inspired by the song ‘Plan 9’ by Hiroki Kikuta, released under a Creative Commons Attribution 4.0 International license. I roll to my feet, giddy with dehydration and dizzy wth sickness. The pharmacy’s worth of meds coursting through my veins is the only thing allowing me to get even that far. My objective: the computer screen across the room. “Oh come on now,” grunts my creative muse. He sprawls out over the couch that I had occupied until a moment ago in wifebeater and boxers, beer in hand. As always, his metaphysical appearance is a direct invitation to litigation from Stephen King’s On Writing that only my obscurity prevents from making it to Maine Superior Court. “Come on what?” I say, rolling a pair of kleenex pills and jamming them in my nose to dam up the flow. My muse snorts. “Or it’ll be more wishy-washy than a drive-thru no-touch,” he says. Author Adriana Schmeidler’s provocative new book was a fictionalized tale of her struggle with eating disorders. Provocative partly because of its subject matter and partly because of the way it commingled the serious health risks of “the Nervosa Twins,” anorexia and bulimia, with a light and breezy comic tone. Accordingly, the book’s publisher–mindful of the enormous success of Schmeidler’s past three books–decided on an aggressive advertising campaign. With the mantra that no press could be bad press, and attempting to trade as much as possible on Schmeidler’s newfound literary fame, they made her the centerpiece of said ad campaign. “Adriana Schmeidler Must Diet” trumpeted the ads, which featured the waifish author looking decidedly malnourished. The implication, naturally, was that a woman as slight as Schmeidler had no need of a diet. The publisher had expected–indeed, they had counted on–a firestorm of protest. Schmeidler herself had a few reservations, but ultimately saw the novel’s comic tone and controversial content as the best way to start a national conversation on a topic she held near and dear. And it was only a matter of time before someone took her up on that apparent request. Enter your email address to follow this blog and receive notifications of new posts by email. The blog updates every day, so be careful!